On Tuesday night, September 22, Jews around the world will commemorate Yom Kippur, the Day of Atonement. For many centuries, Jews in the Land of Israel prayed at the Western Wall, the remnant of King Herod's retaining wall of the Temple complex destroyed in 70 AD. Several readers noticed and commented on the intermingling of men and women in these historic pictures. It was not by choice. The Turkish and British rulers of Jerusalem imposed severe restrictions on the Jewish worshipers, prohibiting chairs, forbidding screens to divide the men and women, and even banning the blowing of the shofar at the end of the Yom Kippur service. Note that the talit prayer shawls, normally worn by men throughout Yom Kippur, are not visible in the pictures. 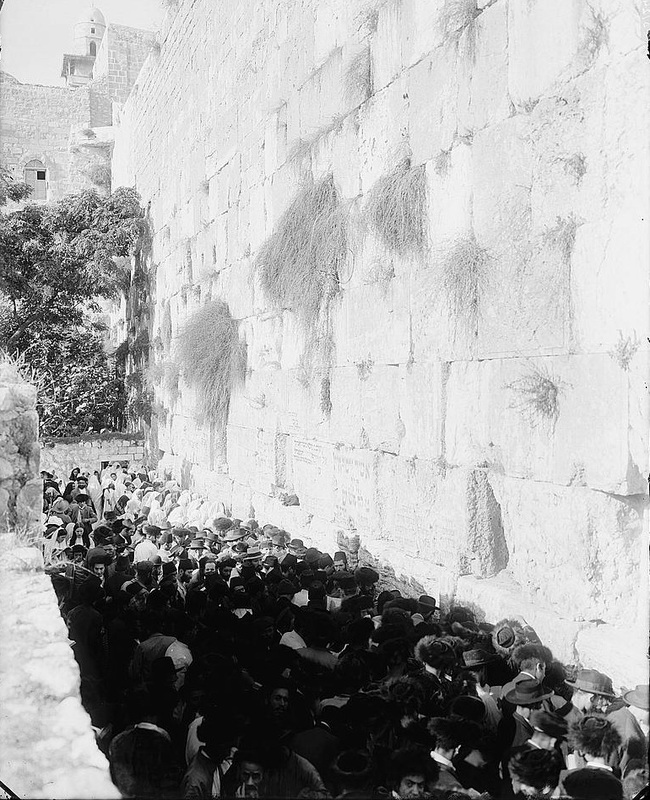 Editor' note: In September 2015, the Ottoman Empire Archives tweeted this picture of Jews at the Western Wall, circa 1900 when the Turks ruled Palestine. Note the small tables permitted at the time, a very unusual concession. We found one rare picture in an Irish church's archives, dated 1897, showing men wearing prayer shawls at the Kotel. 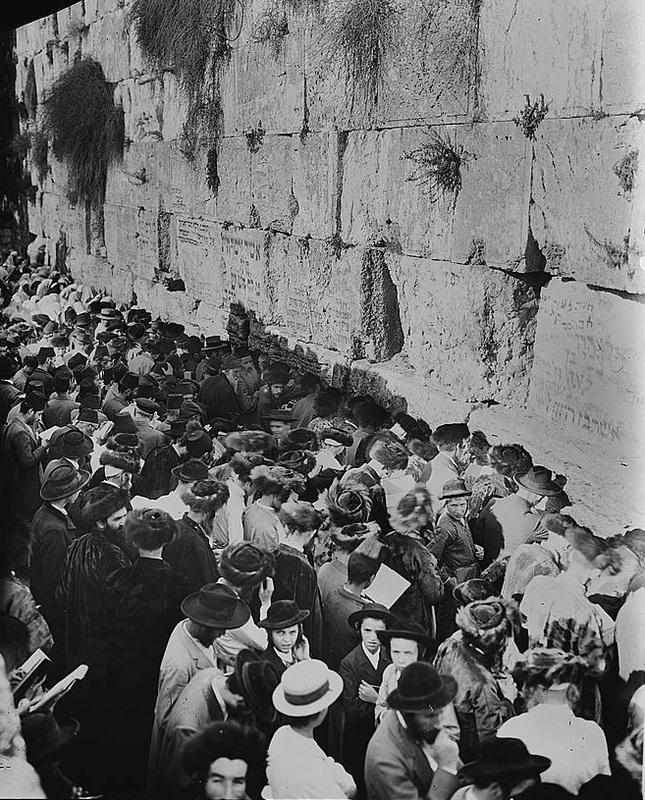 For the 19 years that Jordan administered the Old City, 1948-1967, no Jews were permitted to pray at the Kotel. 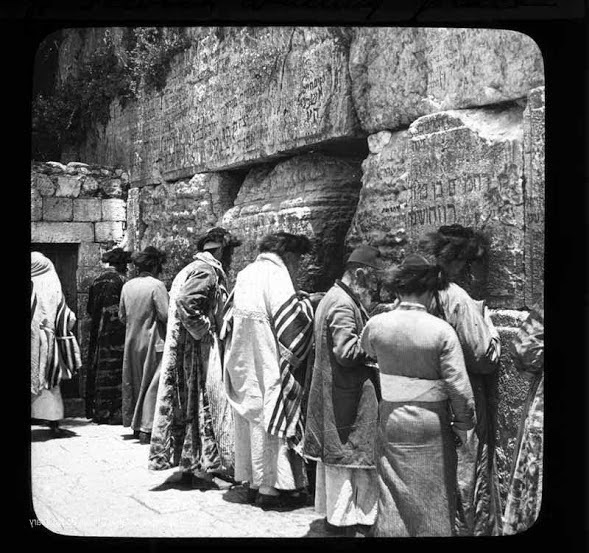 Many of the photo collections we have surveyed contain pictures of Jewish worshipers at the Western Wall over the last 150 years. 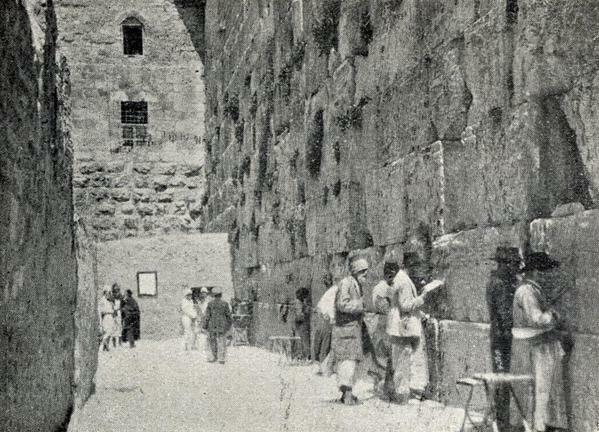 After the 1967 war, the Western Wall plaza was enlarged and large areas of King Herod's wall were exposed. Archaeologists have also uncovered major subterranean tunnels -- hundreds of meters long -- that are now open to visitors to Jerusalem. In the large pictures, the men do not seem to be wearing prayer shawls except in the far corner. It is the custom to wear a prayer shawl during all the services on Yom Kippur. Why is it assumed that the picture was taken on Yom Kippur?